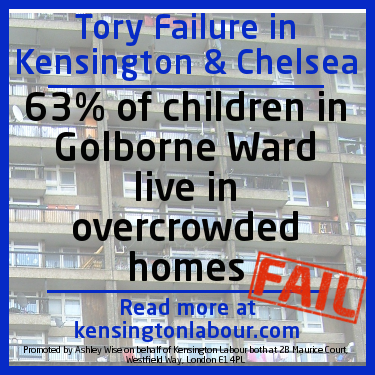 Every day between 20 Feb and 5 March, when they will announce their alternative Budget, Kensington Labour Group will announce an area of extreme inequality in Kensington and Chelsea ‘the most unequal borough in Britain’. The borough known as ‘The Royal Bank of Kensington and Chelsea’ has £180m in Reserves – and some of the poorest residents in London. Kensington and Chelsea is a dense borough, though ‘lived density’ is not measured, only ‘built density’. It is worthwhile reviewing the number of second and empty homes alongside density values. Overcrowding for school-age children means less space for homework, rest and privacy, and is a known indicator in poor educational attainment. Where there are more overcrowded homes, there is greater need for homework clubs in libraries and other centres with access to IT, and specialist help in core subjects to support children struggling to keep up. In one part of the borough, one in five homes are empty; in another there are no second homes. Where is this ghost town? And where would you rather live?